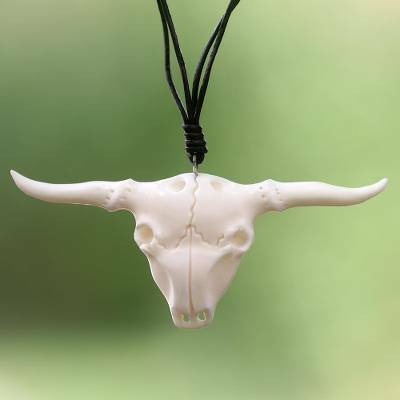 Artisan Crafted Unisex Longhorn Theme Pendant Necklace, "Desert Longhorn"
Made Wardika depicts a longhorn skull, dried white beneath the desert sun. Working in bone, he carves the pendant by hand and displays it on a long cord necklace of dark brown leather. Animals are a favorite theme for this Balinese artisan. The carving is really nice but polished so smooth that it looks like plastic. Didn't care for the thin necklace so I'm trying to change it to something more substantial but the eyelet in the piece is too small to fit an average cord through.